Morrie Turner, the legendary Oakland-born cartoonist of such popular titles as “WeePals” will be honored today at 2 PM in Room 6 A at Comic Con 2012 in San Diego (trip sponsored by Tout.com). Turner’s work spans 4 decades and he’s best known for bringing characters that had racially diverse friendships to the newspaper cartoon World. I had the pleasure of finally meeting this man who was recently celebrated by the Oakland City Council, thanks to Councilmember Libby Schaaf, and who best represents Oakland’s long-time sprit of diversity and racial harmony Friday at Comic Con. We sat down for a 7 – minute video interview that will be posted by this Monday, and then afterward, Turner was on the phone, wishing Libby’s stepfather Bob Schock, a happy birthday. Is this is first time at Comic Con? “No. I was here three years before. I love it. But this time, I see so many artists and work I’ve never heard of before.” When we talked about the reason for that, I half-jokingly said that it was due to Hollywood producers looking for comic books to turn into movies, so you’ve got a lot of new people out there hoping to be the next big hit that gets optioned. Turner was greeted by fans and had some of his books on hand for sale. 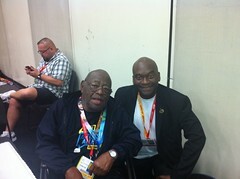 Be the first to comment on "Morrie Turner: Oakland’s WeePals Legend At Comic Con 2012"